It juts out angrily, like the blade of one of those old can openers, ready to tear a gash into a freighter or a tanker, or even a passenger ship with the audacity to sneak out of the bottom of the Red Sea without paying some tribute to miseries of its bordering nation states. 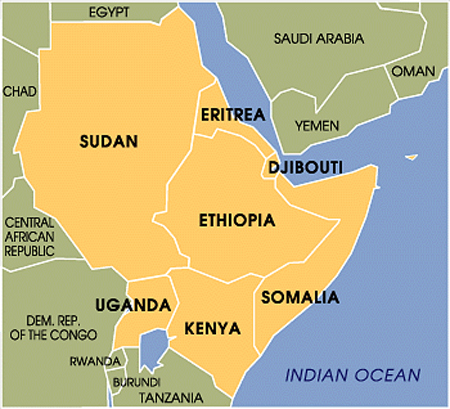 The Horn of Africa. A giant freighter or tanker might be sliced open like a can of peaches if the “horn” pincered it up against neighboring Yemen. I wouldn’t care to wash up on either shore. It’s Somali pirate alley. By 9PM the Boat Deck where I customarily take most of my leisure (after my morning workout in the gym of course) is locked down. But I sneak through the door anyway. The moonless night and the un-lit deck blindfold me and I stumble over a folded deck chair. A voice, close by, says “mind where you step,” but I can’t see who it came from. “Security . . . or pirate?” I ask. My eyes start to adjust and I begin to make him out, sitting on a storage cabinet and peering into the black void through night vision binoculars. We are skirting the north side of the Horn of Africa, the Somali coast, No. 1 sea pirate waters, and security staff are on highest alert. Inside the second-sitting diners are probably not giving piracy a second thought; but for me, this is an exciting part of the cruise. Is that because the second book I read as a child was Treasure Island? Maybe, but a few days ago I downloaded to my Kindle, William Langewiesche’s The Outlaw Sea: A World of Freedom, Chaos and Crime. It is eye-opening, and there is a chapter on piracy that I had read a couple of years ago that was published in The Atlantic that came to mind when I realized I would be sailing in waters infamous for hijacking and sea piracy. 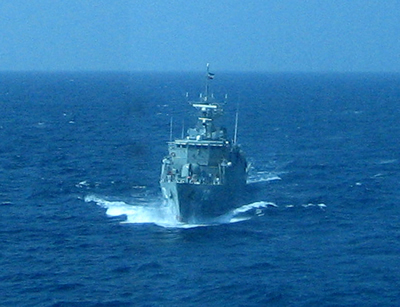 Although it has been much in recent news, the waters around the Horn of Africa do not lead the world in sea piracy. That title is shared by the South China Sea and the Strait of Malacca. I will get a shot at the latter when we sail through en route from Kuala Lumpur to Singapore—during the night. The narrow strait is well-suited to pirate attacks and Langewiesche recounts the story of a Japanese-owned freighter that was boarded there, the crew set adrift (they were lucky; other crews have been murdered) and the ship disappeared, having been re-named and re-painted and its cargo sold off. It was only one of nearly 1,300 such incidents between 1998 and 2001. Your average cruise ship passenger has no reckoning that putting to sea in a vessel with a moniker like Vision of the Seas (or deity forbid, the Fahrtwind, see 74. 3: Kusadasi Winds (Turkey) 10.19.2011) is a little like getting off the wrong freeway exit and getting lost in one of those hoods that make you check your door locks (see Bonfire of the Vanities). But Langewiesche argues that the almost four-fifths of the earth that is water is outside of the control of any particular government and any coherent set of maritime laws. Get twelve miles off shore (basically over the horizon) and you are in many respects on your own. In international waters you are in a truly international world. It is a world in which ships might have a registry in Panama, Liberia, even Bolivia. Owners likely reside in yet other countries, and ownership might be clouded by layers of corporations in multiple locations. The registries are called “flags of convenience” because these are places that are lenient in their laws and light in their taxes. Google the “registry” of the ship that I am sailing in and you will get Bermuda, or Liberia, or Gibralter. Hey, it’s owned by a British company (I think), so why not London or Bristol? So you probably don’t want to get into a legal conflict with the ship you or your cargo is sailing in. Then there are the people who man these vessels. A freighter crew might consist of Filipinos, Indonesians, Malays, Easter Europeans, you pretty much name it. And the Captain might be from Denmark, or Japan, and the officers from still different backgrounds and languages. * The crew on my ship consists of a British Captain and officer staff, the “hotel” is run by a German, the restaurants by an Italian chef, tables are waited by Turks, Belorussians, Serbs, et al, cabins are maintained by Filipinos and Indonesians, the engineering staff appear to be Filipinos and Indians, l and I think the security staff are Gurkhas. We should be re-named the SS Babel. **If the PLO took an interest in our ship they would have a field day with the number of passengers with disabilities. For that matter, we could legitimately have painted huge red crosses on our nice white hull.